A new Digital National Security Archive collection from our Iraq project is now available through ProQuest. The National Security Archive, working with our partners at ProQuest, is publishing a new compilation of documents on the Iraq war, one of the most consequential events in recent history—for the United States, Iraq, the Middle East, and the international community. The 2,141-document collection of primary source documents, Targeting Iraq, Part I: Planning, Invasion, and Occupation, 1997-2004, will illuminate the path to war and its many unanticipated consequences. Information in the collection will also be useful in examining an issue of continuing concern: the politicization of intelligence to serve political ends. The majority of the documents published in the new publication were obtained from FOIA requests filed by the National Security Archive’s Iraq project and its director, Joyce Battle, with the State Department, the Defense Department, the Defense Intelligence Agency, CENTCOM, the Central Intelligence Agency, and other agencies that participated in making policy toward Iraq. 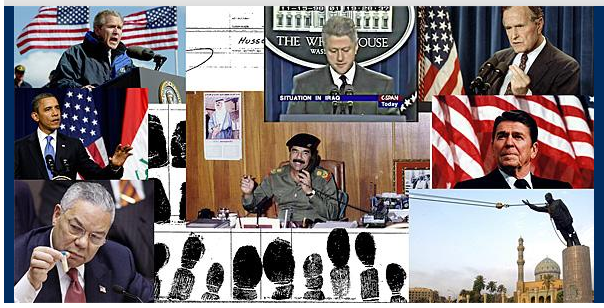 The records provide historical background on U.S. policy debates over Iraq dating to the Clinton administration; internal records that detail the Bush administration’s decision-making leading to Operation Iraqi Freedom, including the controversial use of false intelligence to justify military action; materials that flesh out the campaign to build domestic and international support for the operation; and documentation covering the first 18 months of U.S.-led occupation. Slides and other briefing materials charting the Defense Department’s months-long development of a war plan for Iraq, ordered by President George W. Bush in late 2001, are included in the collection. Memos and background papers discuss strategies for achieving American goals. Documents dating from March 2003 onward reflect frequently changing strategies to respond to the many reversals and setbacks encountered after the invasion that the United States had not anticipated. These included rising, increasingly violent opposition to the continuing presence of American troops, sectarian conflict, rampant looting, the collapse of Iraq’s physical infrastructure and civil society, and massive displacement of the civilian population. Also included are reports of human rights abuses committed by American forces, culminating in exposure of the systematic torture of detainees at the Abu Ghraib prison. Other documents discuss attacks on Iraq’s museums and libraries and the sustained destruction of its antiquities and archaeological heritage, attributable in considerable part to the actions or the inaction of occupying coalition forces. Documents dating from mid-2003 through mid-2004 provide background on attempts to ensure consolidation of long-term objectives in Iraq by a United States under pressure from Iraqis and from the United Nations to end the occupation and restore Iraq’s sovereignty. Background information is included on American decisions to dissolve Iraq’s military and security forces; to dismantle most of its civil service (through enactment of a de-Baathification policy that was intended to bar from positions of authority anyone connected to the former government); to draft a new Iraqi constitution; to implement a new oil law opening Iraq to global markets; and to negotiate Status of Forces and Strategic Framework agreements institutionalizing long-term U.S.-Iraq military cooperation. Documents discussing American measures to privatize Iraq’s economy, eliminate state-owned enterprises, and facilitate contracts for international corporations to invest in Iraq’s reconstruction are also part of the collection. 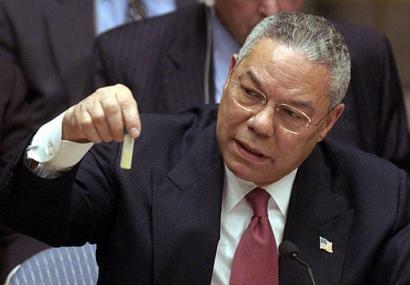 U.S. Secretary of State Colin Powell holds up a model vial of anthrax during his historic presentation before the United Nations Security Council, February 5, 2003. The documents also demonstrate the symbiotic relationship between policy and promotion that dominates our perception of world affairs. The United States presented its case for war in the most persuasive light possible and successfully orchestrated a campaign to market the invasion of Iraq. The public, press, congressional, and, to an extent, opposition party skepticism required for an effectively functioning democracy was lacking during the lead-up to the Iraq war – despite a vibrant global antiwar movement. The result was a conflict that turned out to be nothing like what had been advertised, resulting in death and injury on a grand scale, trillions in costs, and the subsequent instability and rise in extremism predicted by war opponents. As of this writing, 14 years after the United States invaded Iraq, the conflict continues. Other Iraq resources from the National Security Archive include the DNSA collection, “Iraqgate: Saddam Hussein, U.S. Policy and the Prelude to the Persian Gulf War, 1980–1994,” and the web postings, such as “The Iraq War Ten Years After: Declassified Documents Show Failed Intelligence, Policy Ad Hockery, Propaganda-Driven Decision-Making,” and “The Record on Curveball,” among many others.